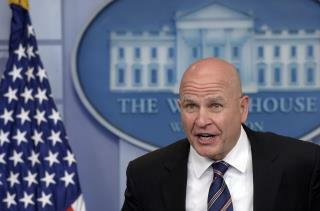 (Newser) – National Security Adviser HR McMaster stepped up his defense of President Trump Tuesday and sought to change the narrative of the classified-info flap: The problem isn't what Trump said, he argued, it's the leak. In a White House briefing, McMaster said that what Trump told visiting Russian diplomats about an Islamic State plot was "wholly appropriate," reports the Hill. He would not address whether what Trump spoke about was classified at the time, notes CBS News, but he said the president "wasn't even aware of where this information came from" because "he wasn't briefed on the source." Might be that loyalty oath is true, how else to you get people to really push your agenda knowing that your boss can change his mind in an instant and throw you under the bus? Seems more people are acting as they are under a loyalty oath. The public needs to know the facts: not distortions of an anonymous leak. This constant controversy is killing patriotism and the news is the most guilty. Get some decent newscasters and honest reporters. Start there. McMaster is correct. Donald Trump acted within scope of presidential power to give the information to Russia. However, McMaster is wrong about the disclosure of the meeting. Since the information had not been known to Trump as classified at the time of making the utterance, the public's right to know engages the matter.